Tip: If you obtained the Crow Caller and completed the event quest previously, you do not need to do the quest or obtain the crow caller again. Open the crown store and obtain your free Crow Caller. Use the Crow Caller to summon Witchmother Olyve to begin The Witchmother’s Bargain quest. Tip: There is a spawn outside Bad Man Hollow's Public Dungeon Entrance that is very close to Daggerfall. Also, there's a pumpkin spawn behind the luxury vendor in Hollow City. Small animals like squirrels, foxes, guar, chickens, snakes, frogs, etc. Find the Witchmother Olyve in her brewery. Pull up the quest and bring up your map to see location. Go to Auridon’s Greenwater Wayshrine (Southwest of Firsthold) in Northwest Auridon. The brewery is a short distance to the the northwest of the wayshrine. Go to Glenumbra’s Crosswych Wayshrine (northern Glenumbra) and head West. The brewery is just northeast of Cath Bedraud and east of Par Molag crafting centre. Go to Stonefalls by the southern dolmen. Fastest way is to travel to the Serk Quarantine Wayshrine in north Deshaan and travel North and East. Complete the quest to obtain your Witchmother’s Whistle. Use the whistle to get experience bonus. Renew as needed. During the event, all boss monsters (such as World Bosses or those found defending Delves, Group Dungeons, Public Dungeons, Trials, Arenas, and Dark Anchors) will drop Plunder Skulls. You do not need the XP buff or the undead polymorph active in order for them to drop. 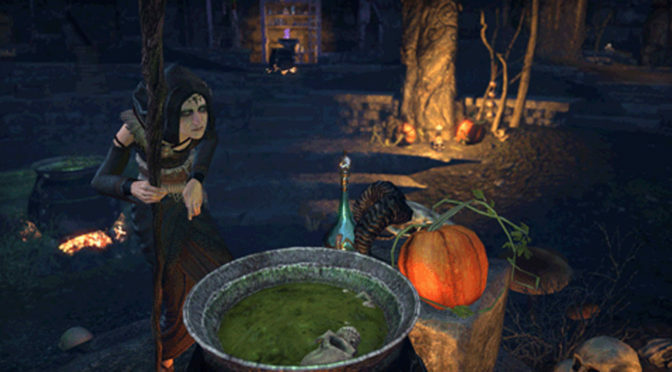 Use the Witchmother’s Cauldron to polymorph your character into one of the undead. Don’t worry—this isn’t permanent! You do not have to use the Witchmother’s Cauldron in order to gain the XP buff. Tip:  Find a delve with few campers. Ideally, a delve used in a daily quest. The usual delve boss timer is 5 minutes but will spawn when a daily quester appears in the room: will likely only get gold off mobs. 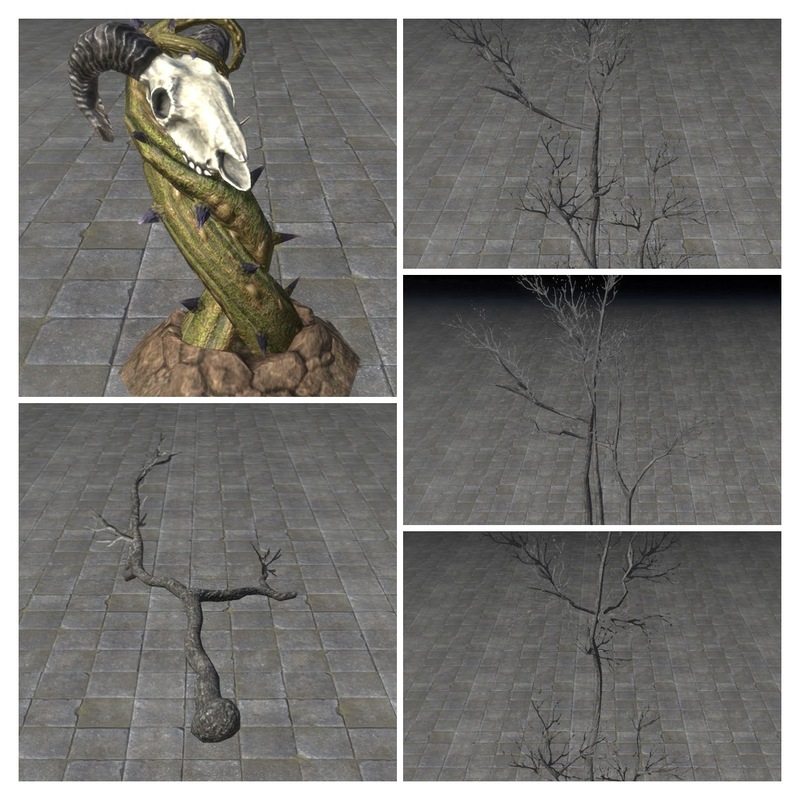 Skulls can also be found on any named, Dolmens, World Bosses, etc.. Tip: Best location is in a public dungeon with multiple nameds in same room. Wait at least 3 minutes between boss kills (eg. in a public dungeon) to maximize your skull drops. Tip: Can gather skulls in Cyrodiil but you have leave Cyrodiil to activate the buff. Tip: You can only loot a skull once every 3 minutes. You can defeat each individual type of boss and be guaranteed a Dremora Plunder Skull once per day, meaning you can acquire up to seven each day. Should you defeat the same type of boss again after already receiving your Dremora Plunder Skull, you’ll receive a regular Plunder Skull instead. Dremora Motif pages can be traded. To earn Event Tickets during the Witches Festival, you must acquire Dremora Plunder Skulls. You will receive one Event Ticket alongside the first Dremora Plunder Skull you earn each day (in addition to the other regular rewards). Note: There was a scandal over the Cauldron recipe where it looked like the Wood Elf Cauldron. To be fixed. Tip: The Exorcised Coven Cottage will be available for purchase with crowns in the in-game Crown Store for the duration of the event, and if you earn the Witches Festival achievement “An Unsparing Harvest” you’ll unlock the ability to acquire this bewitching home for in-game gold! Complete the Witchmother’s Bargain quest. Consume all 9 of the recipes listed below.